• What is the difference between Shotokan and other martial arts? • What is the youngest age, or at what age should I start my child? • I'm in my 20's, or 30's, or 40's, even 50 plus years old. Is it to late to start karate? • I'm so out of shape. Should I get in better shape before enrolling for karate classes? • What is a karate training session like? • Can I watch or attend a karate session before enrolling in classes? • How often should I attend karate sessions? • What belt colors do you use and what do they mean? • How long does it take to become a black belt? • "I'm a teenager", or, "I'm an adult, but will I be in a class with little children?" • Is karate training aerobic? • Can I lose weight doing karate? • When can I start and how long is an enrollment? A: Shotokan is a Japanese form, or style, of karate. This karate style originated in Okinawa and was developed by a schoolteacher named Gichin Funakoshi. From a very early age Gichin Funakoshi studied a collective of martial arts, this collective was commonly known as Okinawa-te. Over time, Gichin Funakoshi developed a type of karate that to this day is referred to as Shotokan. The name Shotokan came about by combining the word Shoto, which was the pen name for Gichin Funakoshi, and the word kan, which in a general sense stands for house of, or family of. By combining these two words, the name Shotokan can loosely be translated as Shoto's house, and/or brand, and/or type, of karate. Gichin Funakoshi introduced Shotokan to the mainland of Japan in 1922. While Shotokan has Okinawan roots, it is regarded as Japanese karate due to Gichin Funakoshi's influence in popularizing Shotokan in mainland Japan among the upper classes and universities. Q: What is the difference between Shotokan karate and other martial arts? A: The simple answer is that Shotokan uses the hands and feet to punch, kick, grab, take down, and strike, as needed. Traditional Shotokan karate does not emphasize kicking more than punching, or punching more than kicking, or grappling more than restraining tacticstraditional Shotokan karate is a varied martial arts system. All styles of martial arts differ in the application of body dynamics and body mechanics. The central focus of some styles use circular whipping motions to create power, some use straight linear movements, and still others use grappling, restraining, and non-resisting methods. However, Shotokan karate explores all of these methods to some degree. The not so simple answer to the question, "What is the difference between Shotokan and other martial arts?" , is that the study of Shotokan karate utilizes five body actions, contraction-expansion, rotation, vibration, drop weight-lift weight, and shifting, to achieve dynamic movement, punching, kicking, and striking. In a general sense, these body actions are not unique, they're used in many activities such as chopping wood, swinging a bat, or swinging a golf club. Ultimately, the application of these body actions to move, set a stance, kick, block, and strike, uniquely classifies the type of karate known as Shotokan. Q: Is karate training aerobic? A: Yes, it can be. Please read the next two Q & A's for more details. Q: Can I lose weight doing karate? A: Yes, it is possible to lose weight with consistent karate training. We've had students that have lost as much as 35 pounds! The cardio activity contained in a typical training session, coupled with a balanced dietary life style, can potentially yield huge weight loss results! The formula to losing weight is not a secret; calorie intake cannot exceed calories burned. We can give you some recommendations to help you acquire healthy eating habits, and the karate sessions will provide the cardio activity required to help you burn fat and lose weight! Q: What is a karate training session like? Q: What color belts do you use and what do they mean? A: The Georgia Karate Academy uses 9 colored belts and the black belt  a total of 10 belts. 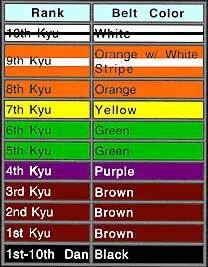 Colored belts are classified by the term of "Kyu". The black belt levels are classified by the term "Dan". There are 10 kyu levels and 10 dan levels. Q: How often should I attend karate sessions? A: You should strive for 3 times a week, minimum. However, beginners may consider starting with 2 times a week until they get accustom to the training sessions, this usually takes about two months. A: The average student that attends sessions diligently, at least three times a week, can potentially become a black belt in about 3 1/2 to 5 years. This window of time is based on individual skill and natural ability. I have never met a black belt, no matter how naturally skilled he or she is, that actually has the skills of a true black belt, without at least 3 1/2 to 5 years of consistent training. Try as you may, there is no substitute for time to balance the skills you acquire. Q: Can I watch or attend a karate session before enrolling for classes? A: Yes! We recommend you attend a week of beginning classes for FREE before enrolling. This will allow you to make an informed decision and to help determine if this activity is a good fit for you or your child. Call and enroll for a FREE trial week today! Q: What is the youngest age, or at what age should I start my child? A: The simple answer is 4 years old, maybe, but I'll address this in a second . . . the GKA uses an early child development system of instruction for ages 4-6. Classes focus on gross and fine motor skill development, etiquette, encouragement, and karate-type games to teach punching, blocking, and kicking. This age group never "hits" each other in a class session. Additionally, a benefit to your child is that they learn the discipline to focus and accomplish assigned task. We have found this benefit can potentially have a positive affect on a child’s character for life, socially and academically. However, some children are just not ready for karate classes at age 4, 5, or 6! We recommend and highly encourage parents to call and enroll their child in a FREE trial week. This will allow the parents and the GKA an opportunity to assess if a child is ready for karate classes. Lastly, generally speaking, children ages 7 or older are typically physically, mentally, and emotionally capable of attending karate classes above the early child development level (pre-k and kindergarten). Q: I'm in my 20's, or 30's, or 40's, even 50 plus years old. Is it to late to start karate? A: If you're health is generally good, then you can start karate at any age. Obviously if you're in your 50's you shouldn't expect the results of a 20 year old, neither do we. But the overall benefits of karate, cardio exercise, muscle toning, discipline, self-defense, etc., can be achieved at any age, provided you set realistic goals. We will do our best to help you set realistic goals. Q: I'm so out of shape. Should I get in better shape before enrolling for karate classes? A: Have you ever gone fishing? Yeah, that's right, fishing? Well, have you ever caught one of those fish that comes right out of the water that needs no cleaning; no scaling, no skin or gut removal? Well, neither have we! You bring yourself to the Georgia Karate Academy, Inc., we'll do our best to clean you up right! We will work with you slowly, professionally, with special attention given to your personal goals. There is a saying in the martial arts community which applies to people who fear they need to get into shape before starting karate classes, "The hardest part about doing karate is getting to the karate studio!". Have no fear, we will work with you . . . call and enroll for a FREE trial week today! Q: I'm a teenager, or, I'm an adult, but will I be in a class with little children? A: NO! The Georgia Karate Academy, Inc. has age specific beginner karate classes; ages 4-6, 7-12, college groups, teens and adults! Q: When can I start and how long is an enrollment? A: The Georgia Karate Academy, Inc., offers year round karate programs. Enrollment is done in either 6 month or 12 month terms. You can start at any time of the year. Please call to schedule your FREE trial week!